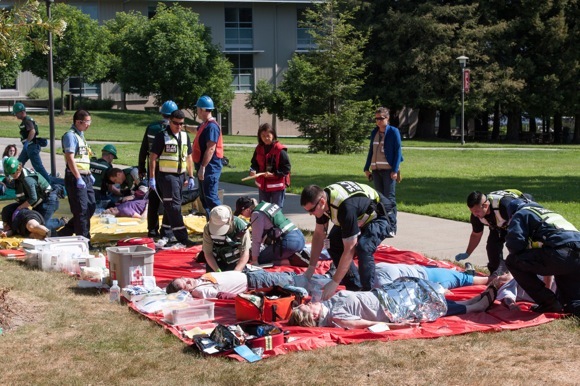 From the east to the west, public agencies in Menlo Park today participated in the Countywide Disaster Exercise known as the Golden Guardian Exercise 2013 in mock simulations of emergency response activities following a catastrophic earthquake, making the city a ground zero of preparedness training. The Menlo Park Fire Protection District in partnership with the town Atherton and the cities of Menlo Park and East Palo Alto were hunkered down at the California Urban Search and Rescue Task Force 3 on Willow Rd, which is designated as the Multi-Agency Coordination Center between all three jurisdictions. The assembled municipalities practiced sharing resources, prioritizing calls, and activating their city emergency operation plans. Menlo Park Police Sergeant Sharon Kaufman, pictured, served as the Operations Manager in today’s exerice. First implemented by former Governor Arnold Schwarzenegger in 2004, Golden Guardian, California’s Annual Statewide Exercise Series, has become the most comprehensive state-level exercise series program in the country. The goal of Golden Guardian is to exercise and assess emergency operations plans, policies, and procedures for all-hazards/catastrophic incidents at the local, regional, and state levels. 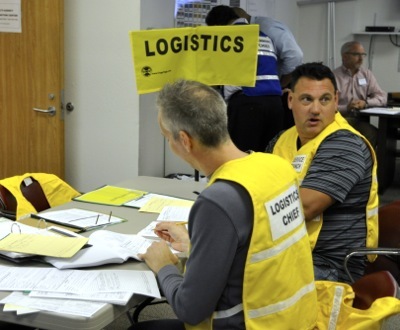 Last year’s efforts focused on a Southern California earthquake while prior years simulated response to a major flood and a terrorist attack on a port.